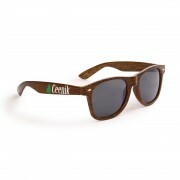 Custom logo printed sunglasses are a powerful way to reinforce your brand in an inexpensive manner. With hundreds of styles and colors to choose from and free artwork development assistance, you can have the perfect shades imprinted with your flawless logo that will be seen and admired by all! Whether you’re a business entity or a charitable organization, having logo sunglasses in your marketing mix is sure to be a profitable investment. Due to their popularity as fashion accessories and protective eyewear, logo shades are useful accessories that quickly get noticed. 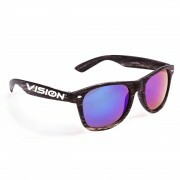 PrintSunglasses.com offers only high quality products that offer 100% UV protection and come with shatter-proof and scratch-proof polycarbonate lenses - all the more reasons people love to flaunt them! Of course, they’re available in an eclectic range of styles ranging from vintage to quirky - so there’s definitely a style that fits your brand image and purpose. 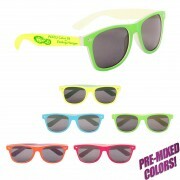 For your custom logo printed sunglasses to get noticed, you need to have a strong design. Now, you can upload a design if you have one or take the assistance of our in house team of skilled and experienced graphic designers who will help you to create, develop or edit a unique design free of cost. As soon as you place your order, you will be assigned a Personal Print Assistant who will collaborate with you in developing a design you’re 100% satisfied with. With nineteen in house ink colors to choose from and PMS color coordination capabilities, we guarantee exceptional imprinting results time and time again. The logo can be printed on either of the two arms or both if you prefer! 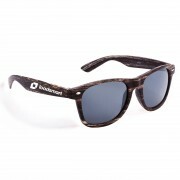 Buying logo sunglasses in bulk is an excellent way to save money. Whether you’re purchasing a set of twelve pieces or a set of 25,000 pieces, we offer discounts but you can avail the best price savings of up to 87% by purchasing in bulk. Customers can access the price tier that’s provided on the right side of the photo accompanying each product listing and know exactly how much they stand to save. Thanks to our cutting edge printing techniques, we offer the quickest turnaround times in the industry and also accommodate rush orders if required! To discuss your unique logo sunglasses requirements, simply get in touch with us! 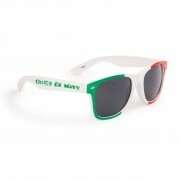 Classic Sunglasses with Mexican Flag Frames! Signature metal adornments above each lens. Available in a full array of fun-loving frame colors. Your price includes a one-color imprint on one temple.